The parish of Southery is situated in the southwest of Norfolk. It lies south of Hilgay and east of Methwold and Feltwell. Southery village occupies the southern half of Norfolk’s largest fenland island. The River Great Ouse runs through Southery and to the extreme south of the parish Brandon Creek marks the confluence of the Little Ouse with the Great Ouse. The name Southery derives from the Old English phrase meaning ‘Southern Island’. The parish has a long history and was certainly well established by the time of the Norman Conquest with its population, land ownership and productive resources detailed in the Domesday Book of 1086. This document states that after the Norman Conquest the parish lands were held by the Abbot of St Edmunds. Various agricultural resources were mentioned including a large number of sheep and a fishery. The earliest archaeological sites recorded in the parish are prehistoric pot boiler scatters. These are clustered around the edge of the island (NHER e.g. 24133 and 24134) and represent occupation at the edge of the fens. In addition to these pot boiler sites, a large number of prehistoric flint implements were recovered by an extensive fieldwalking survey in the 1980s. Tool types identified included cores (NHER 24303), flakes (NHER 24366 and 24504) and scrapers (NHER 14691 and 24502). Odd sherds of prehistoric pottery (NHER 24364) were also recovered by this work. A number of interesting Bronze Age finds supplement this fieldwalking data. Various tools have been found across the parish and these include a dagger (NHER 2563), axe hammers (NHER 2568 and 24552) and macehead (NHER 4456) made from stone. Other copper alloy artefacts from Southery comprise swords (NHER 2566), palstaves (NHER 2567 and 11950), axeheads (NHER 2569), dagger (NHER 4458) and spearheads (NHER 13890). Two Bronze Age inhumations have also been recorded (NHER 2585 and 2586), with one of the skeletons, dubbed as ‘Nancy’, being accompanied by eight jet beads and a bronze awl (NHER 2586). Few Iron Age sites have been positively identified in Southery. A couple of pottery scatters with Iron Age sherds have been reported (e.g. NHER 24436) around the fringes of the island. The only other noteworthy finds from this period consist of two coins (NHER 16785 and 24551). There is rather more evidence for Roman activity in the parish. The majority of the sites and finds are clustered towards the south and west of the island. The most impressive site (NHER 14549) lies just above the inlet that severs Southery from Hilgay, with over 2000 pottery sherds being recovered by fieldwalking. It has been suggested that this area was the hub of a Roman farmstead. Work on the Southery bypass just south of this area also recorded a number of Roman pits and ditches, and some of these were filled with carbonised grain (NHER 13937). Other Roman ditches and pits were discovered by excavations in Feltwell Lane during 2004 (NHER 41028). A possible Roman butchery site has also been identified to the south of Further Fen Farm (NHER 16525), and this would seemingly fit with the notion of a farmstead in this area of the island. In addition to these sites, a possible Roman industrial area or rubbish dump (NHER 14057) has been identified immediately east of New Barn. Finds from this site included a bone needle, gold coin and pottery sherds. This site may relate to a possible occupation site in the surrounding area. At this point it is also worth mentioning that a diverse range of Roman artefacts have been found in Southery. These include boar tusk ornaments (NHER 2571), a cosmetic mortar (NHER 24360), an unusual trumpet brooch (NHER 24468) and a small hoard of illegible coins (NHER 2572) found near to the border with Feltwell. This artefactual evidence, when combined with the sites discussed above, suggests a significant level of activity during Roman times. Evidence for a Saxon presence in the parish is rather more fleeting. A hanging bowl (NHER 14549) is the one of the few finds dating to the Early Saxon period. Collections of Middle Saxon pottery sherds (e.g. NHER 13904 and 17316) from the centre of Southery show probable settlement here before the medieval period. Other Middle Saxon finds include a loomweight (NHER 13904) and a copper alloy pin (NHER 24468). A similar pottery corpus exits for the Late Saxon period (e.g. see NHER 15647 and 17316). Archaeological evaluations on Westgate Street in 2006 also recorded a probable Late Saxon pit containing occupation and possible industrial remains. This work may suggest that a great deal more Saxon archaeology lies underneath the area of Southery village. 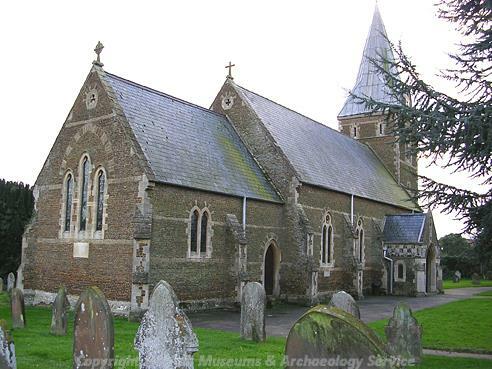 During the medieval period the community was centred on the old church of St Mary (NHER 2590). This church is now ruined, having fallen out of use by the mid 19th century. It was replaced in 1858 by the new St Mary’s Church (NHER 2591), which stands southwest of the ruins. This new church (NHER 2591) features a few furnishings from the old church along with the base of the medieval village cross in its churchyard. No medieval manorial site has been recognised within Southery. Modney Hall (NHER 4459) dates to the 18th or 19th century, and it has no precursor. However, this Hall does stand on the site of Modney Priory, which was founded as a Benedictine cell before 1291 and dissolved in 1539. However, there is evidence that the inhabitants of Southery enjoyed the use of a network of canals (see NHER 24725 and 29184). The course of the Little Ouse River from Clouds Drove, Hockwold to Brandon Creek (known as Brandon River in the 17th century) is artificial and was probably created in the medieval period. This canal cutting would have proved time consuming and difficult to build but would have improved trade and communication links to and from the parish. As one would expect, a large number of medieval coins and pottery sherds have been recovered from Southery. A couple of more interesting objects have also been found and these comprise a superb 14th century seal matrix depicting the Archangel Gabriel and Mary facing each other (NHER 24298), a 14th century iron sword (NHER 21290), a quillon dagger (NHER 2580) and an apple corer made from a polished sheep bone (NHER 35146). During the post medieval period a programme of land drainage and reclamation was instigated. 19th century Ordnance Survey maps and the map of Norfolk produced by Bryant show the locations of numerous drainage mills (e.g. NHER 16047 and 16050) and drainage pumps (NHER 2594 and 14500). The fertile fenland soils would have been suitable for arable farming, and the sheer number of pumps/mills suggests an intensification of agriculture in the parish during this period. In addition to the drainage mills, several windmills used for corn grinding were erected in the post medieval period. One of these, the so-called Bone Mill, stood to the west of the modern Baker’s Farm on the Sedge Fen road (NHER 16126). This mill was established during the Napoleonic period and survived until it was washed way in 1915. Apart from the aforementioned Modney Hall (NHER 4459) and new St Mary’s Church (NHER 2591) very few buildings of architectural interest were constructed during the post medieval era. 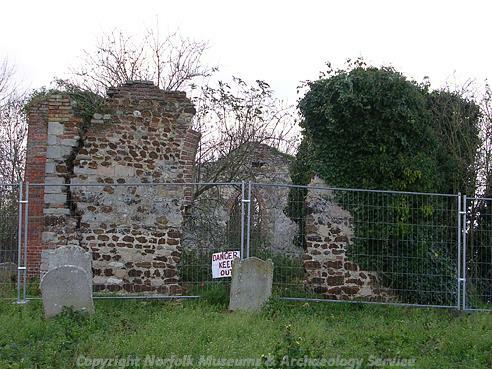 However, number 41 Westgate Street (NHER 17127) is of interest because the large chimneystack askew to the present line of the house may indicate an older date for the property, and that the current fabric is a re-casing of older work. The 19th century Gothick building (NHER 38112) across the way from this property is also intriguing, as the architecture suggests this property has been converted from a set of 17th century stables. A number of post medieval items have been recovered from Southery. The majority of these artefacts are relatively mundane and relate to the everyday existence of the parishioners. These include objects like jettons (NHER 15648), clay smoking pipe fragments (NHER 15648), a pottery skillet (NHER 15741), part of a candlestick (NHER 24468) and numerous gunflints (NHER 24195 and 24212). There are several records detailing structures built in the parish during World War Two. Three pillboxes (NHER 24500, 32682 and 36283) exist at various locations across the parish, and a type 28a anti-tank gun emplacement (NHER 32684) stands near to the telephone exchange by Brandon Creek, facing north up the A10 road. Rather pleasingly, a civilian air raid shelter also survives in fine condition to the rear of number 2 Westgate Street. The most recent archaeological site dates to the Cold War period. This takes the form of a Royal Observation Corps Post (NHER 35430) that stood in a field to the northwest of Town’s End. It was in operation from 1959 to 1991, at which point it was demolished. All that now remains of it is the telegraph pole. Thomas Sunley (NLA) 12 June 2007.